Jason from Ross Roofing has attended to my leaking roof on several occasions in the past year. After several years of trying to find the cause of leaks all over my house, he managed to quickly determine the likely causes and we are slowly working towards solving all of the issues remaining from the poor workmanship of my previous roofing contractors. 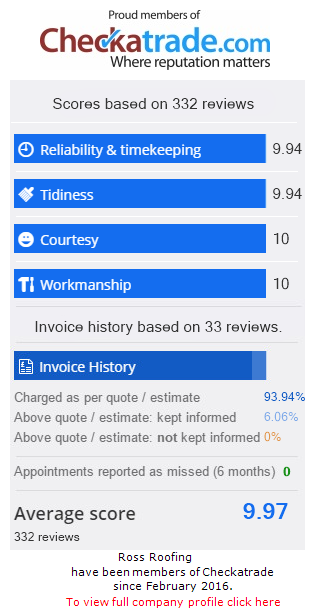 Aside from his roofing expertise, he is very personable, reliable and professional and I would definitely recommend his services and will be calling if I have any further problems! I can highly recommend Jason of Ross Roofing. He was thoughtful, careful and attentive throughout, and the finished work was of very high quality. Given the quality, the work was very reasonably priced too. I know who I will call if I need help in the future! Jason did a great job installing a new eave support tray, forming lead saddles and pointing. Altogether very impressed. He is very professional and approachable. I have no hesitation in recommending. We have used Ross Roofing twice for repairs to our existing roof and have been very happy with the service provided. The work was done to a high standard at a competitive price. Jason was very good to deal with – personable and reliable. We are likely to be needing further work to our rather ancient roof and I will definitely be contacting this company again.